DOVER – To achieve public compliance with laws and regulations through education and enforcement actions that help conserve Delaware’s fish and wildlife resources and ensure safe boating and public safety, Fish & Wildlife Natural Resources Police officers between March 26-April 1 made 1,244 contacts with hunters, anglers, boaters and the general public, issuing 14 citations. Officers responded to 33 complaints regarding possible violations of laws and regulations or requests to assist the public. An increased Fish & Wildlife Natural Resources Police presence continued at the C&D Canal Conservation Area and Michael N. Castle Trail. Fish & Wildlife Natural Resources Police officers, along with other division staff, will be attending the Ducks Unlimited Greenwing Conservation Festival on April 14 at Fish & Wildlife’s Owens Station complex near Greenwood, where we will be providing kids casting activities, hunter education, patrol vessel, Operation Game Theft trailer, and waterfowl and trout stamp displays, as well as K9 and waterfowl banding demonstrations. On March 27, Fish & Wildlife Natural Resources Police officers presented information on hunting, fishing, and boating laws and regulations during the Village of Fox Meadow’s civic association meeting, near Newark. On March 29, Fish & Wildlife Natural Resources Police cited Brent Shockley, 65, of Seaford for two counts of possession of river herring near Seaford. Shockley was fined $214, including court costs and released. Fisheries Conservation: Possession of river herring (2), unlicensed fishing (8), and illegal use of cast net in tidal water within 300 feet of a dam or spillway (1). Boating and Boating Safety: No life jacket on a child age 12 or younger as required by law (1). Other: Operating a motor vehicle off an established roadway on a state wildlife area (1)*, and operating an unregistered motor vehicle on a state wildlife area (1)*. 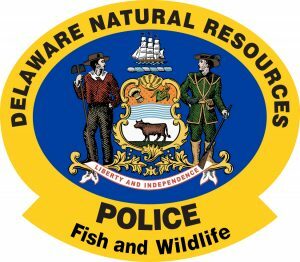 Fish & Wildlife Natural Resources Police remind the public that Delaware’s 2018 spring wild turkey hunting season begins Saturday, April 14 and runs through Saturday, May 12. With the excitement of spring turkey season, hunters are encouraged to always place safety and ethical hunting practices first and foremost. Unlike some other types of hunting, turkey hunting is an interactive sport that often involves calling to the birds and moving around in the woods to increase the opportunity of harvesting a gobbler. Hunters are reminded that it is unlawful to drive wild turkeys, to shoot a wild turkey on the roost or, for safety purposes, to wear red, white or blue while hunting. For more information on hunting in Delaware, click on 2017-2018 Delaware Hunting and Trapping Guide. The guide also is available in printed form at DNREC’s Dover licensing desk and from license agents throughout the state. Follow Fish & Wildlife Natural Resources Police on Facebook, www.facebook.com/DEFWNRPolice/.